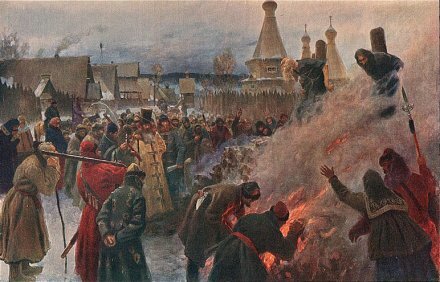 On this date in 1682, the Orthodox “Old Believer” priest Avvakum was burned at the stake in Pustozyorsk — part of Russia’s brutal crackdown on religious dissenters. Old Believers rejected — with varying degrees of obstinacy, ranging at its most dramatic to communal self-immolation — liturgical reforms (and a concomitant expansion of central authority) forced by Patriarch Nikon. The conflict between the institutional church and Old Believers resulted in Orthodoxy’s great 17th-century schism, and persecution of the recalcitrants that waxed and waned for generations. Avvakum, a protopope of one of the principal Moscow cathedrals, was at the forefront of the resistance as the schism opened, refusing to be reconciled with Nikon. His tart autobiographical account — of miracles, devilry, preaching and persecution — captures an arresting, if obviously partisan, view of the situation. Wonderful are the works of the Lord and inexpressible are the designs of the Most High! He suffers punishment, but he has mercy and heals again. But why go on and on ? God’s an old hand at miracles, he brings us from nonexistence to life. And surely he will resurrect all human flesh on the last day in the twinkling of an eye. But who can comprehend this? For God is this: he creates the new and renews the old. Glory be to him in all things! The “Life of the Archpriest Avvakum” is reprinted in Russian, English and Belgian here, and a slightly different English translation is extensively annotated here. * One of the liturgical changes at issue was making the sign of the cross with two fingers (the old way) or three (the new way) — a particularly emblematic symbol of the conflict (notice Avvakum’s two-fingered blessing in the icon above). The dispute had a notable artistic use in Boyarina Morozova, a Vasily Surikov painting of an Old Believer defiantly holding up two fingers as she is hauled to exile.